My story starts years ago at the age of 18. I joined the service 3 days out of high school. Jumped on a plane and headed out to Fort Benning, Ga. I signed a contract to become an Army Ranger! I always wanted to be that guy coming out of the water covered in camouflage with the hat on and everything. I entered basic training and moved on to Advanced Individual Training, then off to Airborne school. After that RIP. How excited I was. Now, Ranger School. During school I tore my knee all to hell. Recycled, I waited as long as I could before I asked to be sent home and assigned to a different unit. I was assigned to the 2/327th Infantry unit in Fort Campbell, KY. There I attended Air Assault school and met some of the greatest people in my life. While stationed there I got married to my high school sweetheart. Shortly after that I received a call saying Kuwait was invaded and it was time to go. I spent a year overseas in Operation Desert Storm and Desert Shield. During this time, I became a father. What an incredible and exciting call I got on the sat phone. The first time I saw my son he was only a couple months old and the tears that fell were filled with joy. During my time overseas in the Middle East I experienced tragedy and joy, brotherhood and anger, gained rank and loss rank, made friends and lost friends. To experience this at a young age was devastating. Watching your brothers taken away from a shoulder fired rocket was the last thing I ever thought I would ever see. Watching your brother scream out in pain that he can’t move because of piece of shrapnel is lodged into his shoulder and neck, another one gasping for air because of a lung punctured and collapsed, and yet another one standing there like a statue in shock with blood dripping out his forearm. I carried the only medic bag we had and having been the only one trained to use it was scary as hell; me having nothing to help with except gauze, tape, morphine and IV bags. The shock factor of this was far too great for a bunch of young men just trying to make it home and be what the world wants us to be. It wasn’t easy. I had to leave the Army; I was angry and didn’t understand what I had just gone through. Years later, my anger and confusion led to my divorce. Seven years later I married again. Still not understanding and suffering from what I experienced, I fathered 2 more boys, and yet another divorce. Still drinking heavily at this time, I was pushed to Victory Gym from my girlfriend. This is where my life began to change. I met Mike “Grunt” Emory, Founder of Victory Gym. He was an Army Sniper and who was suffering from similar issues. If not for meeting this man, I am willing to say I wouldn’t be here to write this. His vision of what we needed as soldiers but didn’t have was on point. A place to interact with the civilians that we no longer knew how to be. The vision of PEER-to-PEER counseling. That is what saved my life, being able to talk to my brothers about what I have seen and done. What no one else understood. I started hanging around more and more and became the volunteer coordinator and the C.O.O. Volunteering my time more and more. Thank you Grunt. Mike introduced me to Jay Holly, Founder of Foundation 14. 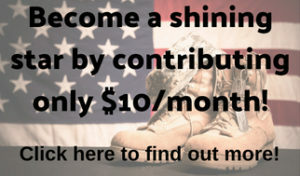 A Charity that supports Combat Veterans with PTSD. His approach was so unordinary, but it worked. His mission was to get Combat Veterans on motorcycles. “Wind Therapy,“ riding along with other like-minded individuals was a game changer. Trust me, it works. I have seen the difference in many, myself included. So much so that I gave the Foundation my other bike to help change another Veteran’s life. During my time with Grunt and Jay I met so many wonderful people. They held events and spoke of issues that the world just doesn’t see. Unique ways to face them. Unconventional ways to battle them. You are 2 incredible people doing incredible things. At one of the Foundation 14 events I met the Director of Bedford Twp. Veterans Center, Tim FitzGerald. Now, this Veteran center is also a different breed. With a Food Pantry, helping with car assistance and providing awareness to the issues veterans are facing in today’s world. Tim saw how the gym was making a difference in our veterans’ lives and wanted to bring the same program to his center. I was able to help do this with the assistance of Jeremy Kurek and Joey “Cookie” Ratcliffe. These men help the program face issues of many different backgrounds and branches. All these men have given me the strength to create an organization to go a little deeper into the issues we face day to day. A foundation of many other organizations combining their resources. Many of our veterans get lost in the system trying to find assistance. The assistance is there but many don’t know where to find it, how to get it and what they qualify for. Thus, the birth of Warrior Ethos Foundation. I was assisted by members of all the organizations above to bring this to life. Our mission is the Ethos! Always place the mission first, never accept defeat, never quit and I will never leave a fallen comrade behind. If we are able to connect with all the charities and private donors out there, we would be able to lead our veterans to where they need to go, who can help and who can’t. The combination of services would lead to many veterans getting the help they need through joint operations. The reason and bottom line to all of this is that we can move mountains if we just combine forces. I want to thank everyone who has influenced my life and given me the strength to talk about what I fear, how I feel and how I got the help and drive that I now have. Don’t be afraid to attend a meeting; I know I was. I sat outside of the peer-to-peer meetings for two weeks straight before I went inside. I am glad I finally went in, the fear and reservation I had to attend a meeting and open up was real. The anxiety that I felt was crippling at times. No one understood me, nor did I understand them. The alcohol consumption was getting out of hand. I was drinking a 5th of alcohol a day, and the Opiates that the VA was subscribing was out of hand. I have been homeless a time or two between my divorces and sometimes during because I didn’t want to be home (if that makes sense) There is no other place I could have gone and gotten the answers I was looking for then Victory Gym and the Peer-to-Peer meetings they have. I am blessed to be able to bring this same outlook and approach to Bedford Twp. Veterans Center. Thank you Mike “Grunt” Emory, Jay Holly, Tim FitzGerald, Bobby Mc Craight, Wade Raddatz SR, Emmanuel “Mano” Paravas, Andy “Bucky” Ammeraal, Eugene “Dingo”Simonescu and our brother Damion “Juggernaut” Rice may you rest in peace.